Challenges facing the finance minister and how they are not as daunting as those facing families who have lost a job. Ontario grappling with this reality. What the IMF says. Contributing factors to the current economic situation. The global storm that hit so hard late in 2008. The bottom line. Impact on families and communities. Ways in which the McGuinty government has invested in a healthy, productive economy. Preparing our very youngest for the economy of the future and the cost-benefits for doing so. A review of the situation for manufacturing and forestry sectors. Investments in infrastructure. Projects that are underway. Supporting innovation and cutting business taxes. Training and retraining resources. Strengthening partnerships. The foundation to build on for the speaker’s upcoming budget. First and second mandates. Balancing budgets, paying down debt, making historic investments in health care and education. Growth in revenues. Details about how budgets were balanced. Other governments and how they are wrestling with the same challenges. Ontario’s capacity to contend. Leading for the long-term. Presentation of the government’s next budget on March 26. What it will include. Specifics to come on budget day. Expectations. General outline of the budget. Expressions of confidence for the future and Ontario’s economy. Jim Hinds: Chairman, Irish Line Capital Inc.
Jo-Ann McArthur: Principal, fisheye, and President, The Empire Club of Canada. Dwight Duncan is an experienced, respected and accomplished politician—a combination that is not common in one who is nowhere near being eligible for senior’s discounts. Minister Duncan’s steady hand on the tiller, and the respect he has earned from colleagues on both sides of the legislature, will serve him well as he guides the province through the global economic upheaval in his role as Minister of Finance for the province of Ontario. Being a finance minister can be a lonely job. But this minister is never alone. He is a team player and a team builder. A person who listens and a person who leads. A strong and effective advocate for the province, and for his constituents alike. He is a proud, life-long resident of Windsor, and his riding, Windsor-Tecumseh, is in the heart of the most important trade corridor in North America. It is also one of the ridings in Canada that is being particularly hard-hit by the economic downturn, which is taking a heavy toll on the automotive and manufacturing sectors. The minister last spoke to a joint meeting of our two clubs last March, the day after he presented his 2008 budget. That seems a lot longer than 12 months ago, given all the upheaval in the world since then. When he joined us again at the Canadian Club a few months later, in October, he noted that the economic challenges facing Ontario, and indeed the world, are “real and directly affecting our families and our businesses.” That was certainly true in October, and even more so today. Deficits and falling revenues have become the new normal for provincial and national economies, including those once awash in surpluses. Even the most prudent governments and savvy investors are seeing a stunning reversal in their financial fortunes. Warren Buffet recently advised in his letter to shareholders that Berkshire Hathaway’s 2008 net income was only $4.99 billion, down from $13.21 billion the year before. Automotive giant Ford, which probably has the strongest balance sheet of all the North American car companies, lost US$14.6 billion last year. But its losses paled next to those of GM, which posted a whopping $31-billion loss. Then there’s the $1.75-trillion deficit projected for the U.S. economy this year. For many of us, it’s hard to picture how many zeros that involves and how deep into the minus column that plunges this wounded economic superpower. All this puts sobering perspective around the prospect of a multi-billion-dollar deficit in Ontario. Over the past few months, Minister Duncan, together with his colleagues in the McGuinty government, has provided considerable economic stimulus for the Ontario economy. And he has prepared us for more difficult times ahead. Today, he will offer us some further thoughts in this regard as the next provincial budget approaches. 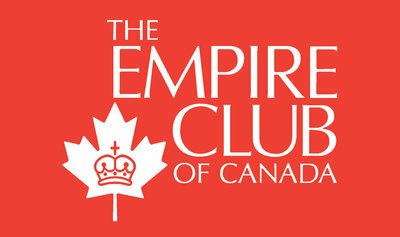 Please join me in welcoming back to the Canadian Club and the Empire Club, the Honourable Dwight Duncan. I am fortunate to have one of the most interesting and challenging jobs you could imagine. Frankly though, the challenges that I face as finance minister aren’t nearly as daunting as those for families who lose a job. Those are the real challenges, real impacts. Ontario, like the rest of the world, is grappling with this reality. The International Monetary Fund (IMF) says, “The global economy is facing its worst crisis in 60 years.” The perfect storm we are living today has been brewing for some time. As far back as 2006 our government was talking about the gathering clouds of a slowing U.S. economy, the rising price of oil and a high Canadian dollar. All these factors contributed to the global storm that hit so hard in late 2008. Now, each and every province is having to cope with forces beyond their control. The order of magnitude and challenges vary, yet the bottom line remains the same: the economic and financial crisis reaches every part of Canada. As an M.P.P. from Windsor, I can tell you, this has a very real impact on our families and communities. Here, in Ontario, we’ve been preparing. We’ve been investing in the foundations of a strong economy since we came to office. Over the past five years, the McGuinty government has invested in a healthy, productive economy. Study after study has demonstrated the strong and positive impact of universal health care and public education on productivity and competitiveness. Healthy workers go to work every day. Investors look for jurisdictions with public health insurance; it’s a crucial part of investment decisions. In education we are helping to prepare our very youngest for the economy of the future. The cost-benefit is clear: good early education has measurable, long-term pay-offs for the economy. Postsecondary education also creates opportunity and is an important contributor to long-term economic growth. A well-educated work force is more productive, earns more and is more innovative. We’ve shored up these fundamentals to help Ontario compete both now and in the future. In 2007, our manufacturing and forestry sectors were struggling and Ontario’s overall economy was sluggish. This reality was emerging across North America and around the world. Our government needed to take immediate action to respond to the prevailing economic conditions. That’s when we launched our five-point economic plan to increase competitiveness. The five-point plan brought to life a number of stimulus measures which are now bearing fruit. This plan, the first of its kind in Canada responding to the current downturn, has invested the equivalent of more than 1 per cent of GDP. In 2008–09, we invested nearly $10 billion in infrastructure, creating about 100,000 jobs. Over $7.5 billion of that investment is on projects that are now underway. We also supported innovation and cut business taxes. We put substantial resources into training and retraining to help Ontarians prepare for the ever-changing global economy. We have also strengthened our partnerships across the board—with municipalities, with the federal government, with the Aboriginal peoples of Ontario and with our partners in key economic sectors. This is the foundation that we will build on in my upcoming budget. Over our first mandate and the first year of the second mandate we have balanced our budgets, paid down debt and made historic investments in the foundations of our economy—health care and education. Over the past four years, the province of Ontario has witnessed unprecedented growth in revenues. Spending growth never exceeded revenue growth on our watch. The same cannot be said for our predecessors. We invested in Ontario while maintaining impressively low debt-to-GDP ratios. Since we balanced the budget three years ago, we’ve paid down debt by $3.2 billion and reduced Hydro-stranded debt by $3.3 billion all the while reducing our net debt-to-GDP ratio. For three years we presented balanced budgets. We were in balance when this financial crisis hit last year. The global situation has changed everything for everyone. It is no longer business as usual. Governments around the world are wrestling with this enormous challenge. Ontario’s capacity to contend with this reality is limited by our relative size. We are a sub-national government in a big global economy. It took time and global factors—very significant global factors—to get here, and it will take time and co-operation among all governments to work our way out. As I mentioned earlier, we have been building opportunity and strengthening our economy for some time. Now though, things are dramatically different and we must respond to this new reality. There is no simple fix. Managing through today’s challenges is not good enough. We must lead for the long term. We have to look at what we can do right now to address the most pressing impact of the global crisis and job loss. At the same time we have to look at how we make sure Ontario is ready for the next generation of growth. Governments must create a climate for job creation and an environment for competitiveness. So that is what we will do. The McGuinty government’s strategy will lead this province through to recovery and beyond. On March 26, I will present the government’s next budget. The budget will include a short-term stimulus package for job creation and a strategy for long-term competitiveness and growth. Our strategy will stimulate immediate economic activity and create jobs today. Leading experts are clear that economic stimulus can be helpful, when it’s strategic, targeted and timely. Fiscal stimulus alone cannot resolve a recession. Our strategy will be more comprehensive than that. Our strategy will be about getting Ontario ready for the future: where our economy continues to create jobs, captures the next generation of growth, and is a world leader in the new economy. Specifics will come on budget day. If I tell you today, I would have to shred you. You can expect continuing investments in infrastructure, in people, in ideas and in the green economy. A recent Brookings Institute study points out that infrastructure development not only creates jobs, but also builds the job opportunities of tomorrow. We will continue to invest in skills and training. The dynamic nature of the global economy means our workers must be prepared for lifelong learning. Training is the best way to help people get better paying jobs in industries on the rise. Bill Gates recently pointed out that improving education is the key to leadership in business and innovative research. The government must constantly work on being more effective and more productive. We’ll spend smarter and continue to practice prudent financial management. We must never hinder growth through cumbersome, unnecessary regulation. We will redouble our efforts on smart regulation, never sacrificing the broader public interest. We will continue to encourage innovation. The green economy is very much a part of Ontario’s long-term plan. Just two weeks ago, my colleague George Smitherman introduced the Green Energy Act. This initiative will make Ontario a world leader in renewable energy, all the while creating 50,000 jobs in the next two years. As a former energy minister, I am convinced that this is the way to go. Innovation like this will set Ontario apart—and give us a competitive edge. I am proud to say that the McGuinty government has been lowering business costs for some time. In the last budget we provided tax relief in the form of a Capital Tax cut and retroactive elimination. We extended the acceleration of capital cost allowances and we accelerated Business Education Tax (BET) rate cuts. Now we are looking to do more. We are looking to do more to help Ontario businesses create jobs as well as supporting the research and development that create long-term growth. Greater tax competitiveness makes it easier to do business, to grow and to employ people. Ultimately, this year’s budget will prepare us for the next generation of growth. The budget will build on the investments we have already made and it will outline our plan for innovation and competitiveness for the future. Ontarians can expect a budget that helps create jobs today while strengthening our competitive edge for tomorrow. Around the world, and across Canada, governments are struggling to maintain services and help mitigate the impact of a global economic storm. Ontario is no different. As revenues have declined and as the global crisis has hit our businesses, governments around the world are falling into deficit. Last summer, Alberta expected an $8.5-billion surplus, but just recently announced an anticipated $1.4 billion deficit in this year alone. Last fall, the Government of Canada was predicting years of surpluses, but by January, they acknowledged a deficit of $64 billion over the next two years. There have been many reports out lately speculating on the size of Ontario’s deficit. There have been quite a few numbers flying around—almost all double digits. We’ll report our best estimates in the budget. I can tell you now that the combined Ontario deficit over this year and next will be in the range of $18 billion. In light of the size of our revenues and the proportion of our deficit to GDP, it will be in line with Canada and other comparable jurisdictions. Using these measures, it will be well below the U.S., and certainly lower that Ontario experienced in the early ’90s. A deficit is not something that we take lightly. It is, however, a necessity in these challenging times. When I present our numbers in a few weeks, I will present a plan and a timeline to move Ontario out of deficit. We have demonstrated over the past five years our commitment to fiscal responsibility and have a proven record of deficit reduction. This experience and commitment will be even more important in the coming months and years. Our budget will be about growth. Our budget will be about job preservation and creation now, as well as strengthening Ontario’s competitiveness for tomorrow. Our budget will be about responding to today’s challenges and leading Ontario to the next generation of growth. Our budget will be about competitive government and responsible fiscal management. Our budget will lead Ontario through financial recovery and back to economic growth. We are going to come through this. It’s going to require tough choices. It’s going to require all of us working together. It will take time. It will require governments working together at all levels and around the world. It will take hard work and it will take a fundamental shift in how we compete here in Ontario and abroad. I’m confident that in a few years we’ll be able to look back on this time and be glad that we made the right choices at the right time and became stronger for it. I am confident because of what we have been able to do in the past. I am confident because of the skills and productivity of our work force, the creativity of our businesses, and the entrepreneurial spirit that permeates this society. Ontario’s economy will come through this bigger and better and stronger. Our children will inherit a province with a high standard of living, a compassionate approach to the vulnerable and unbounded opportunity to achieve all they set their minds to.